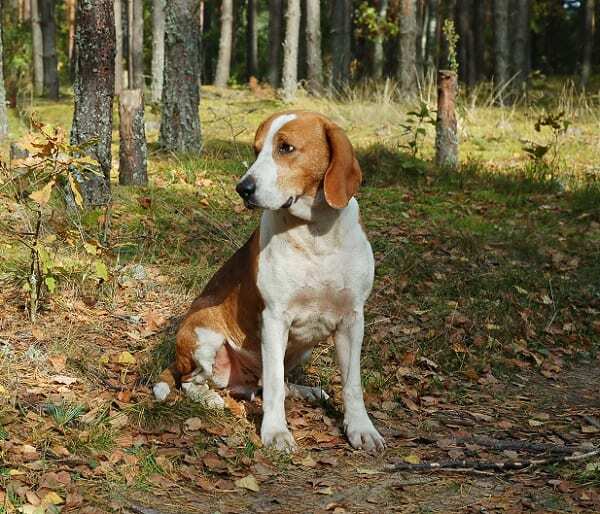 As one of the most popular pets in the world, there’s a high chance you grew up with at least one dog, or knew someone who had a dog to call their own. After all, a dog is man’s best friend! However, if you are an animal lover, you’ll know that the current climate is a tough one and that governments and major charities around the world are now urging potential animal owners to adopt and not shop. Rather than buying puppies for an extortionate price from breeders, people are encouraged to make donations to animal shelters across the world, and take in an animal who has suffered a terrible fate before being taken in by these charities. 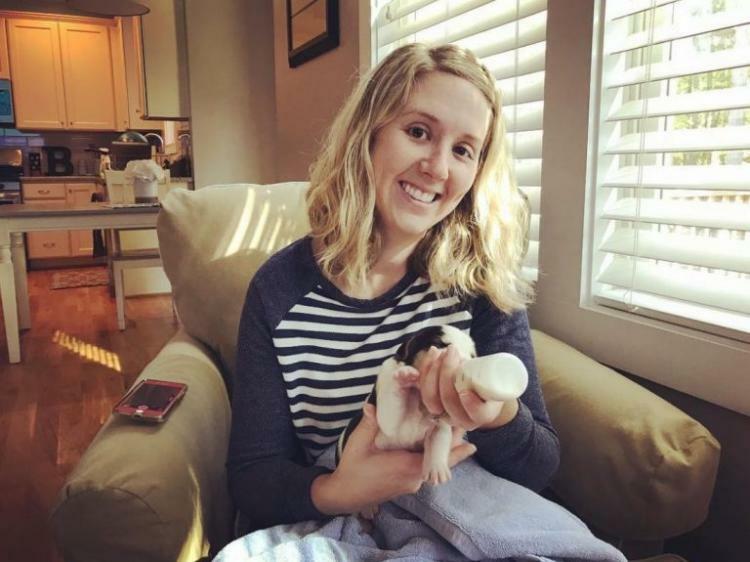 However, to truly understand this story we need to know a little more about the couple in question, and who took on the challenge of adopting a pregnant dog. Well, say hello to the Black family! 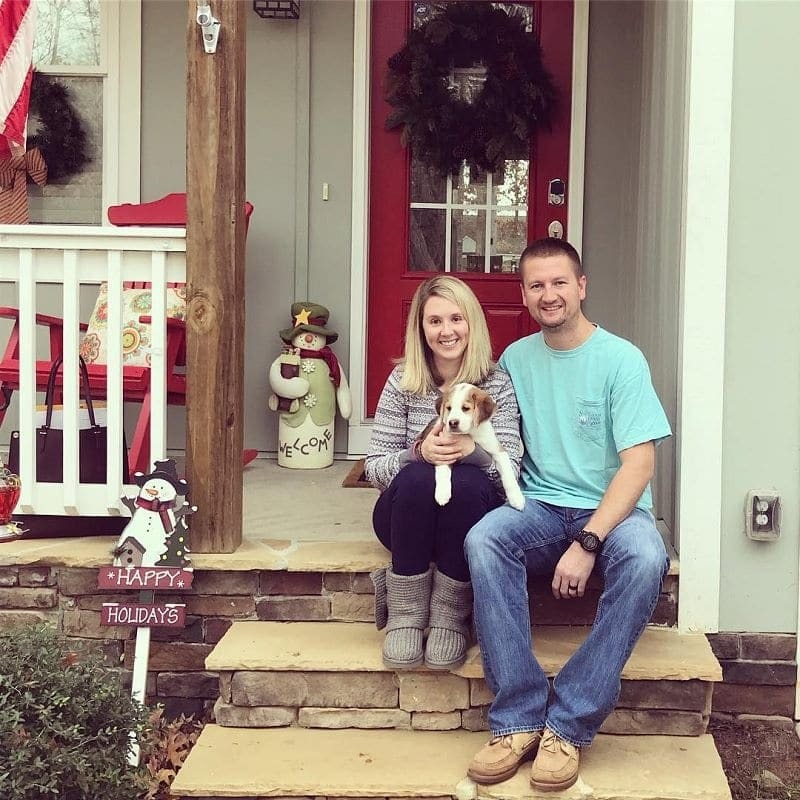 This couple currently live in Raleigh in North Carolina and have spent their lives surrounded by adopted dogs. They now look after three rescue dogs in their house; Winchester, Leroy, and Annie. Their home has been full of dogs since 2009 when they made the first step to becoming a foster home for dogs – specifically pregnant dogs. They wanted to ensure that these dogs were well looked after, and so were their pups. 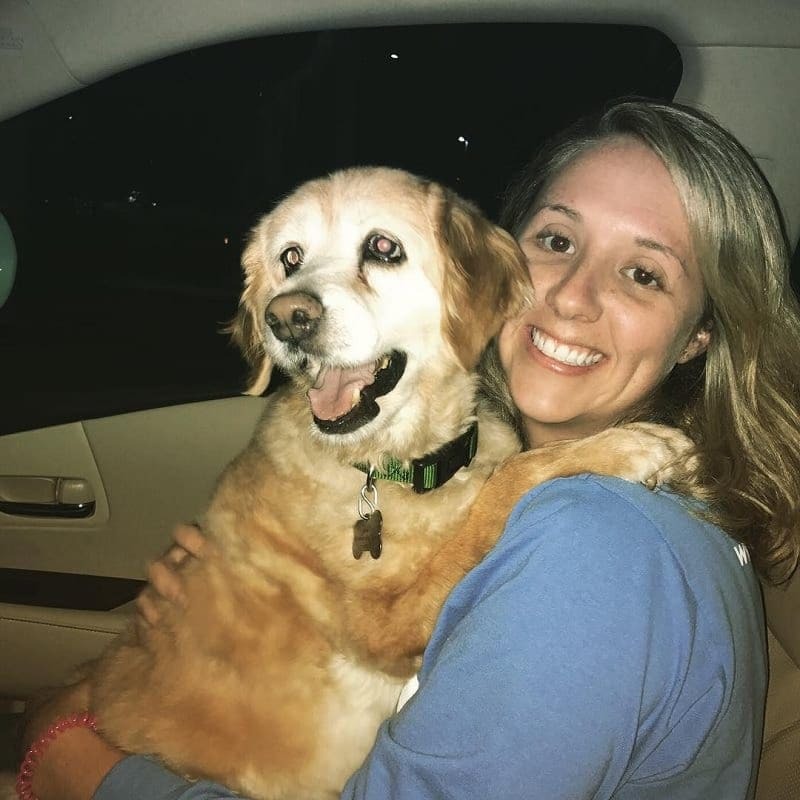 In fact, the selfless couple were registered foster parents in their local area and mostly worked in partnership with the Neuse River Golden Retriever Rescue Shelter. They became known for their selfless acts of kindness, and their love for all kinds of dogs. They would take in these dogs with no questions asked, and they would later look after them for many years – as well as their pups! Yet, they recently made a name for themselves after one of their stories became a viral sensation. 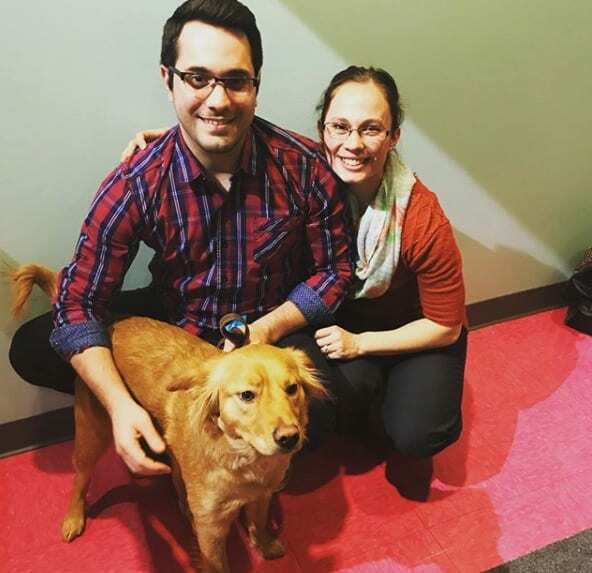 In October 2017, the couple was approached by their local shelter, who were looking for a new home for a golden retriever mix called Rosie. 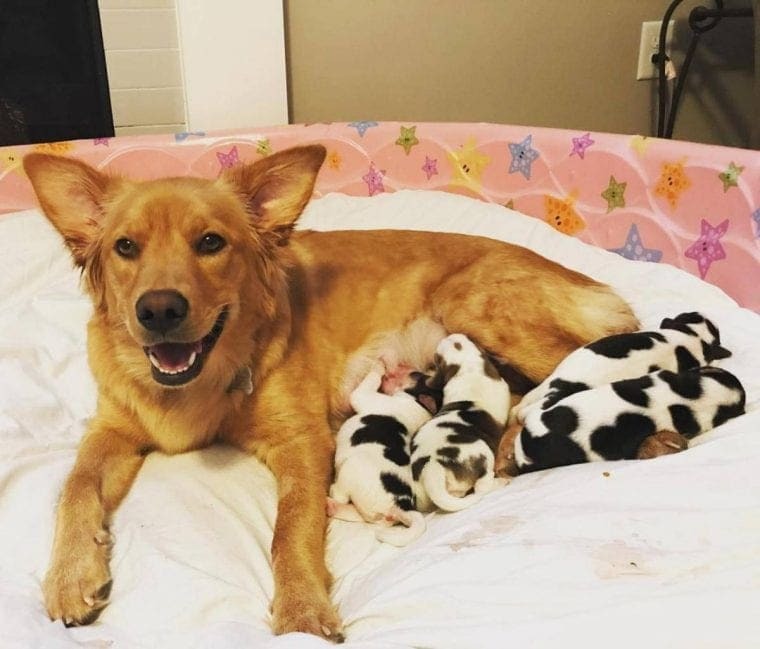 Sadly, her previous owners had abandoned her when they realized that she was expecting a litter of puppies, as they did not want to have to deal with the expenses and the complications of birth. The manager of the local shelter was eagerly looking for a new home for Rosie, as he was worried that she would give birth without any around her to love her. However, Rosie was not picked up by their local shelter originally. 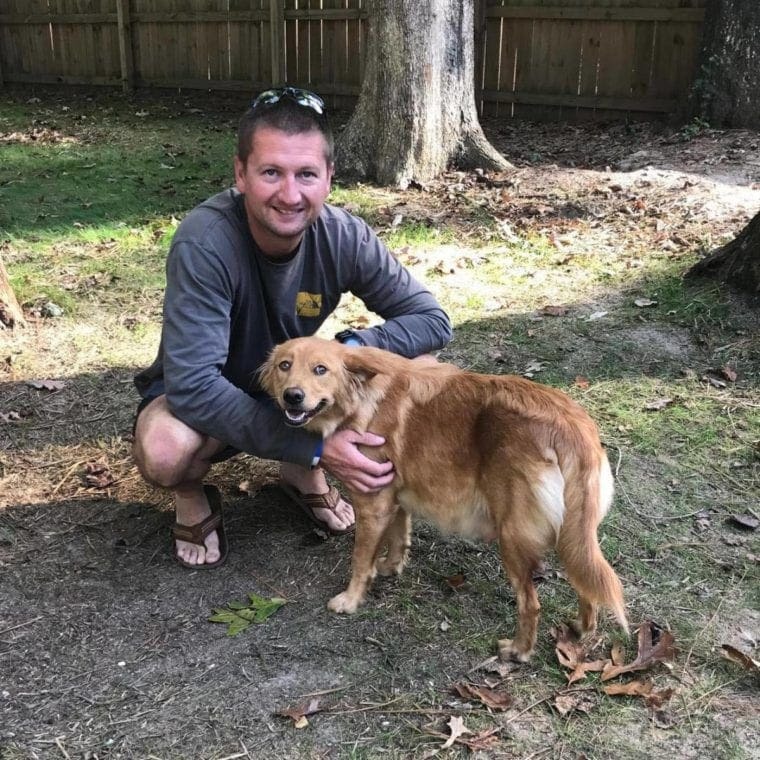 In fact, Rosie had been abandoned in another state and was later transferred to Neuse River Shelter as they specialized in golden retrievers. As the Neuse River volunteer was introduced to Rosie, they couldn’t believe how pregnant she really was. In fact, she was ready to pop! The volunteer was extremely worried, as Rosie looked as if she was about to give birth any minute, before they could get her to the vet. 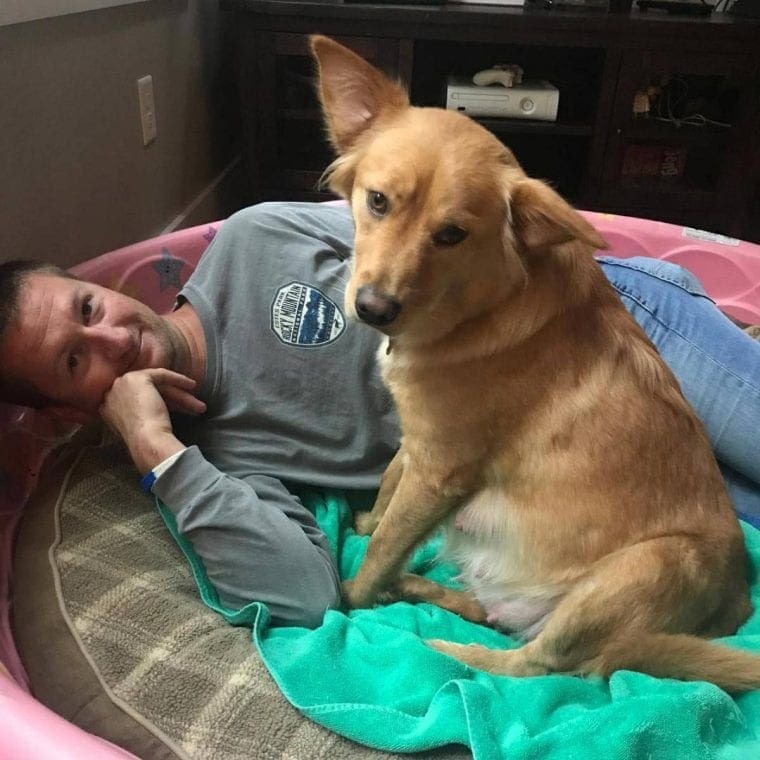 Thankfully, Rosie managed to get to the vets before she gave birth, and she was later taken to Neuse River, where they would attempt to find a new home for her. 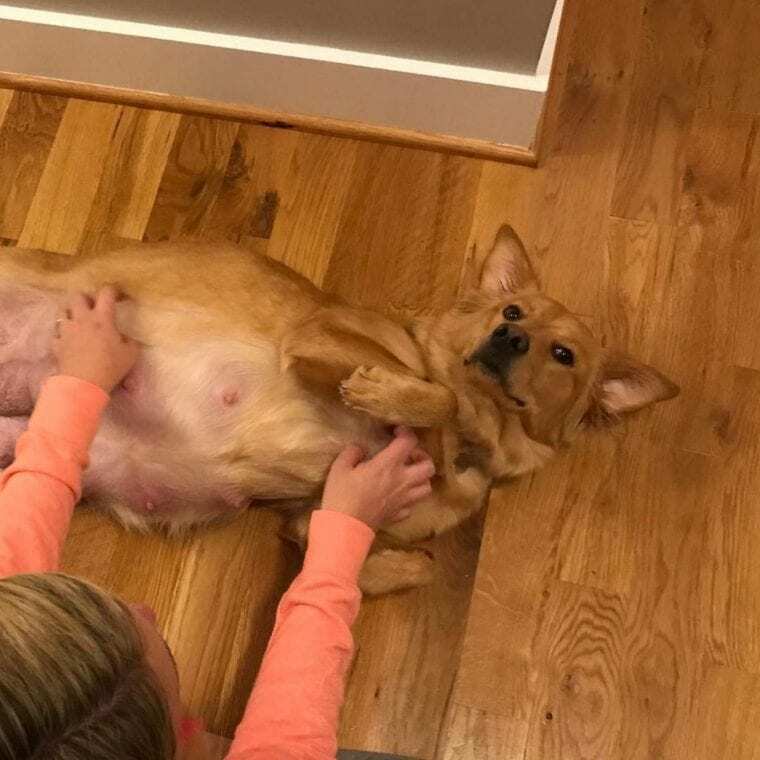 The shelter contacted the Blacks and asked them whether they would take in a heavily pregnant golden retriever – and they said yes! The couple was ecstatic to learn that they would be adding another dog to their brood, and posted a photograph of Rosie onto their Instagram page for all of their followers to see. 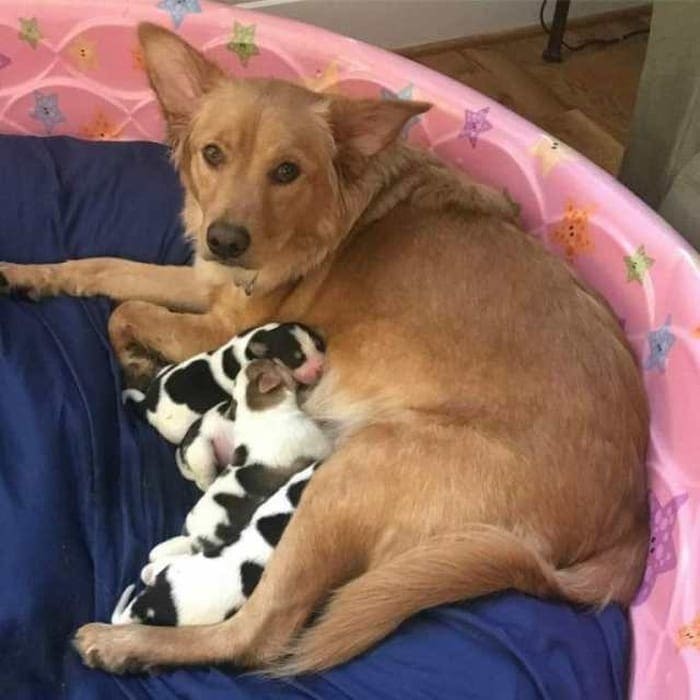 After just a few days with her new family, Rosie finally gave birth to a litter of four puppies – but they weren’t quite what the Black family were expecting. In fact, they looked nothing like their mother! 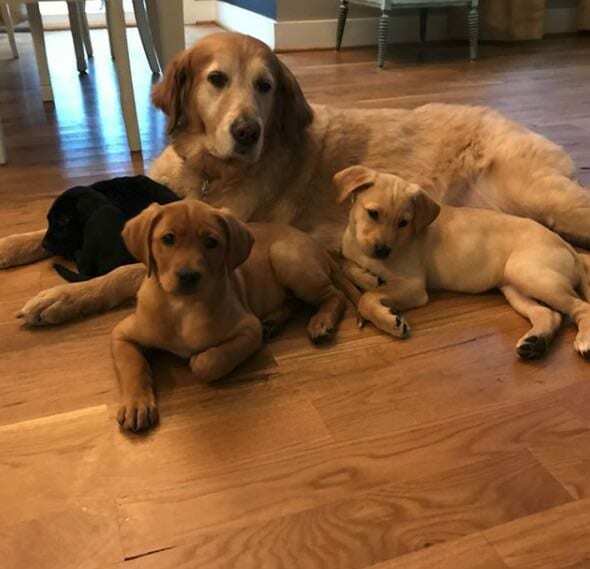 While they puppies all looked identical to each other, they were nothing like Rosie, who was blessed with a beautiful golden coat. 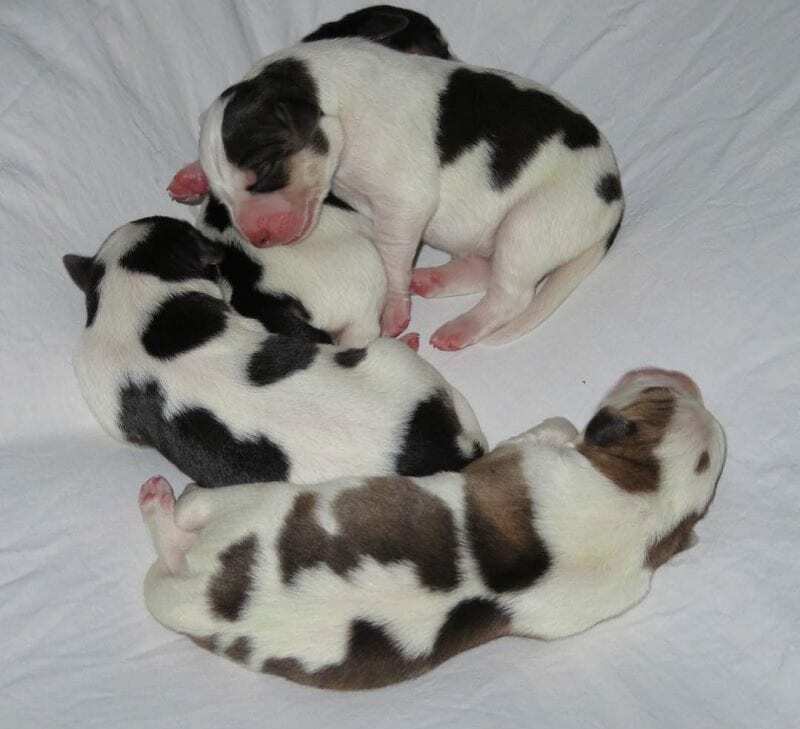 Instead, these puppies looked more like cows, with white and black spots on them. Katie Black later posted on her Instagram that the “puppy pile” was a complete surprise to them both. Although the Black family was incredibly shocked by the appearance of the new puppies, they couldn’t deny that they were utterly adorable. They found themselves falling in love with the puppies and their fun personalities, and found that their friends and family found the little ones extremely entertaining. Puppies are always fun to have around, and when they look as adorable as these bunch, it’s hard not to want to share them with the whole world. Apparently, when the Blacks showed the strange looking puppies to Katie’s parents, they were just as entertained as the Blacks were by how different they were from their mother, Rosie. Katie Black later told the Press Association that her father couldn’t get over the fact that the puppies looked so different, and “laughed for quite a while” at the photographs of the puppies next to their mother. We can’t blame him, since it is a strange, funny, and adorable sight to see. In fact, Katie’s father was so overwhelmed by the photographs that he knew something like that would go viral. Because of this, he persuaded his daughter to post the photo online to see what kind of reaction it received. So, Katie posted a photo of Rosie and her pups – which were called Moo, Clarabelle, Daisy, and Betsy – on the social media site, Reddit. Before they knew it, the photograph was being shared across all internet platforms and had been seen and shared by millions of people across the globe. Amazingly, the post became a viral sensation. The Reddit post managed to rack up an impressive 90,000 likes within the first few weeks and received around 1,600 comments on it. Considering it was Katie’s first foray into the world of Reddit, these were mighty numbers. 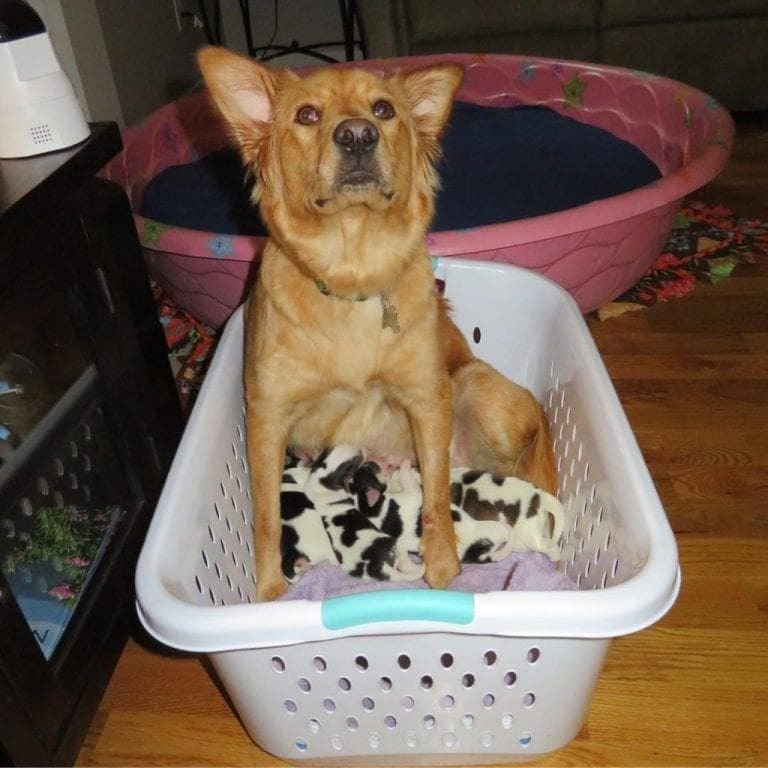 She soon realized that it wasn’t just her father who found the picture of Rosie and her pups extraordinary – because the rest of the world did too! Rosie and her puppies had become famous in the course of a few days and taken the internet by storm. As Katie continued to look at all of the Reddit comments and likes, she couldn’t believe her picture was greeted by all kinds of comments. 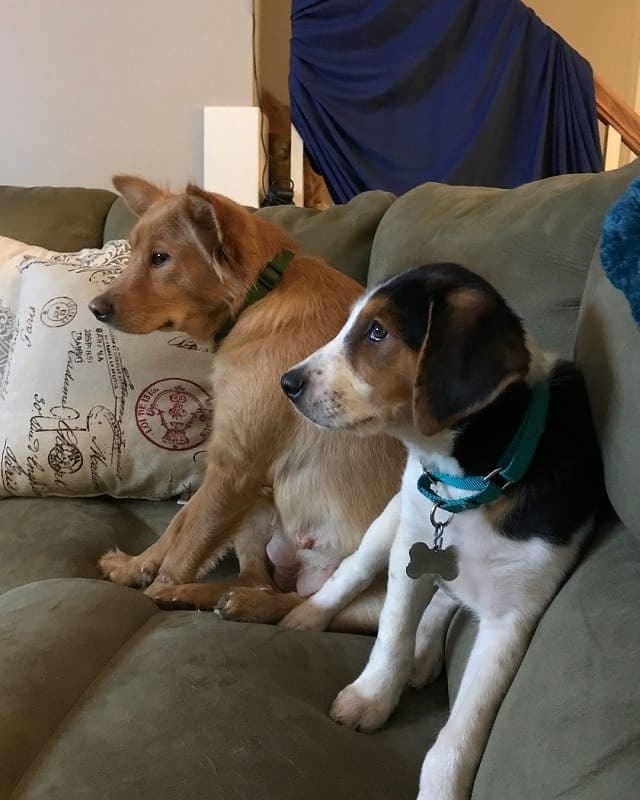 There were those who couldn’t believe their eyes, there were those who had fallen in love with the unique pups, and there were even those who tried to explain why the puppies looked so different. One hilarious Reddit user even stated that Rosie looked just as confused as the rest of the world at the arrival of her unusual puppies. As more and more comments came flying in, the Blacks began to wonder themselves about the breed of the puppies. After all, Rosie was ready to pop when they first fostered her and had no idea about her background. They didn’t know where she had come from, or where she had lived before she made her way to the rescue center. Because of this, they also had no idea who the father of her puppies was, or what breed he was. So, the race was on to find out about her litter. Although Rosie herself was over the moon to have her very own litter to take care of, she didn’t get off to the best of starts. While she tried to take care of them as best she could, Rosie soon came down with a postnatal infection. She was incredibly ill during this rough patch and needed constant care and attention. She was also given antibiotics to treat the infection, which needed to be administered a few times a day. 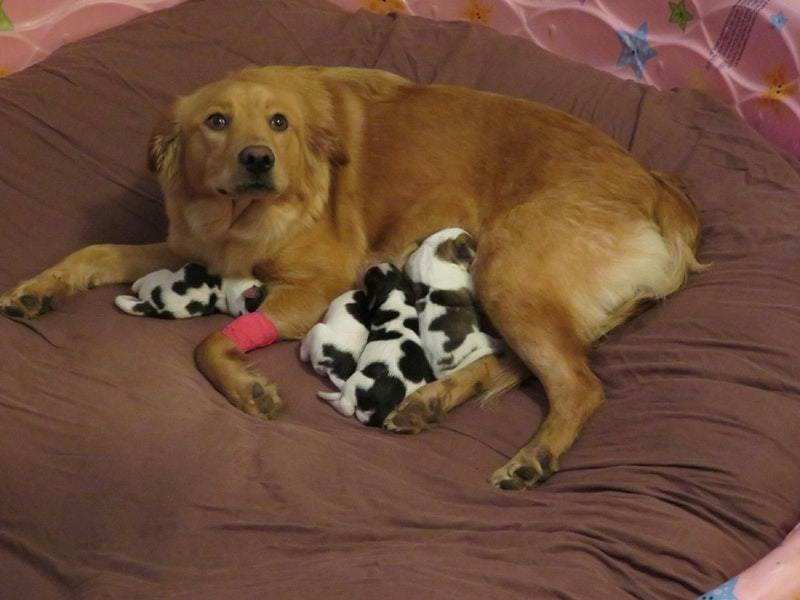 This meant that she needed help with her pups. Luckily, the Blacks family were on hand to help the puppies get through their first days in the big wide world. While Rosie was going through her treatment of antibiotics, they had to bottle feed the puppies every few hours. However, this wasn’t a burden for the couple. 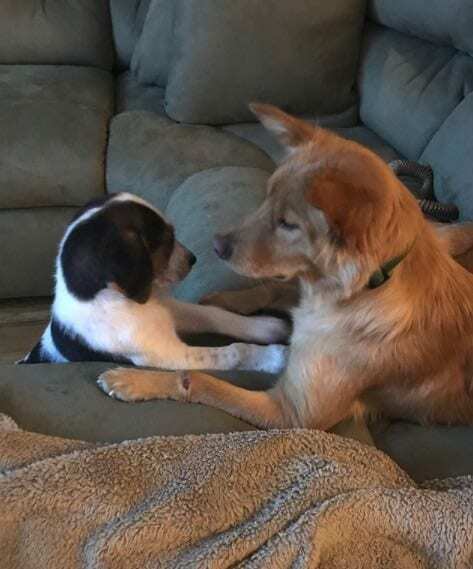 They had fallen completely head over heels in love with the adorable puppies and tried to spend as much time with their foster puppies as possible, as they knew they would eventually have to move on from their loving home. In fact, Katie Black was so overwhelmed with how small and adorable the puppies were; she thought they looked good enough to eat! 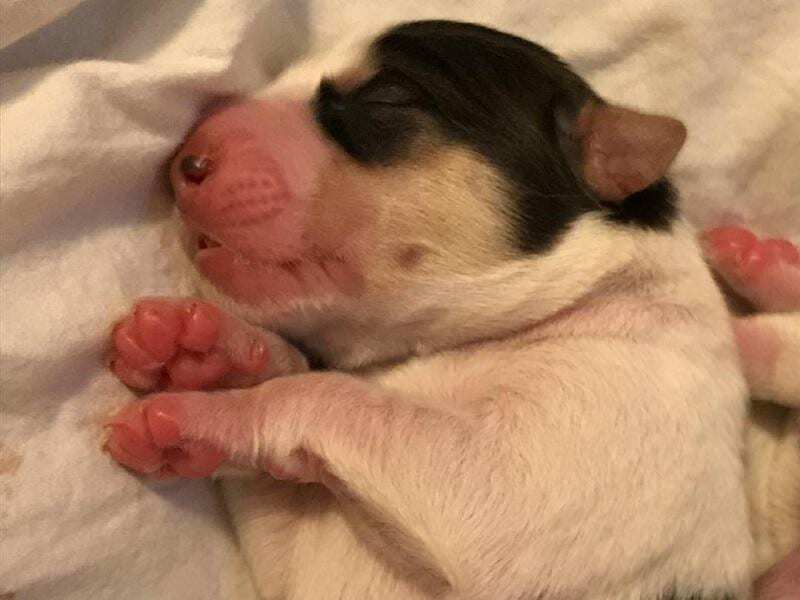 As she posted more and more photographs of the puppies on her Instagram page every day, she couldn’t help herself from gushing over their tiny bodies. In fact, on one photograph she noted that she was practicing some serious self-restraint by “not biting Daisy’s tiny paws.” She just couldn’t resist their little faces and their little yelps. She was totally in love with them all. By December 2017, the four unique puppies were growing larger and stronger by the day – and Katie could see so many changes in their appearance. In fact, by this time they had already started developing their own little personalities. During one of her many Instagram posts, Katie noted that Clarabelle and Daisy were the most different. While Daisy was shy and slightly less confident around her siblings and the Black family, Clarabelle was fearless and made all of them laugh with her hilarious personality. Katie also noted about the personalities of Moo ad Betsy during this Instagram post. Moo was the kind of puppy that always wanted to be cuddled, and Betsy was incredibly sweet – and she loved all of them! 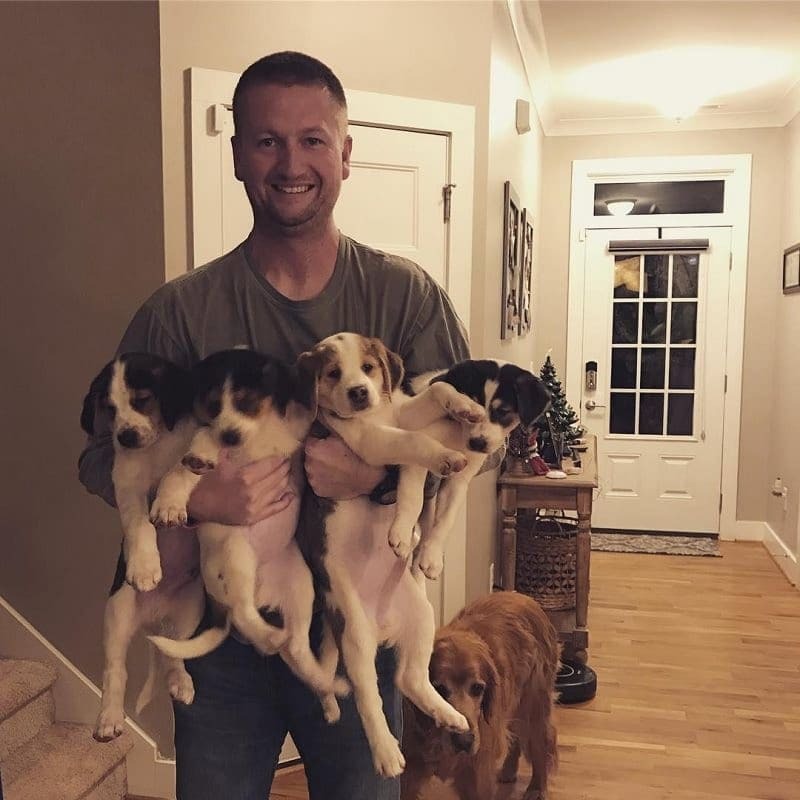 Although Katie was falling even more in love with the puppies as their personalities came out, she soon started to prepare herself for the inevitable. As they were only foster parents, the puppies and Rosie herself would soon have to leave the Blacks’ family home to find a new forever home. 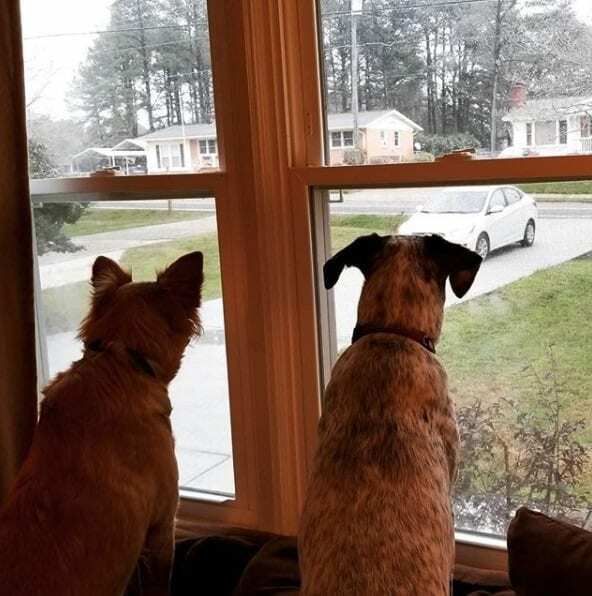 By that point, the couple still hadn’t found a forever home for Rosie, as it is often much harder to find people who will adopt an older dog, but the Blacks still had hopes in their hearts that she will find someone to care for her. In the meantime, they kept on dedicatedly taking care of Rosie while searching for a good home and suitable family for her. Luckily, the Blacks were more than happy to keep a hold of her and keep them within their ranks! 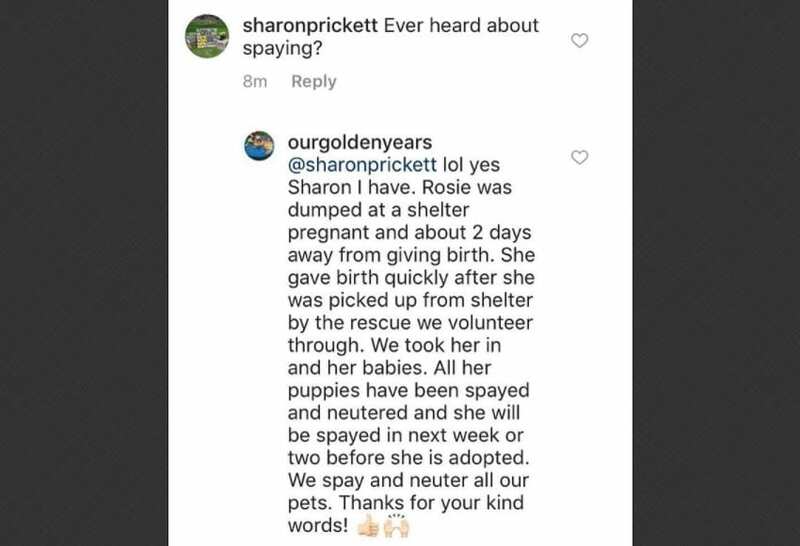 The Blacks did spay Rosie a while later – not because of the rude post, but because they believed it was the responsible thing to do. 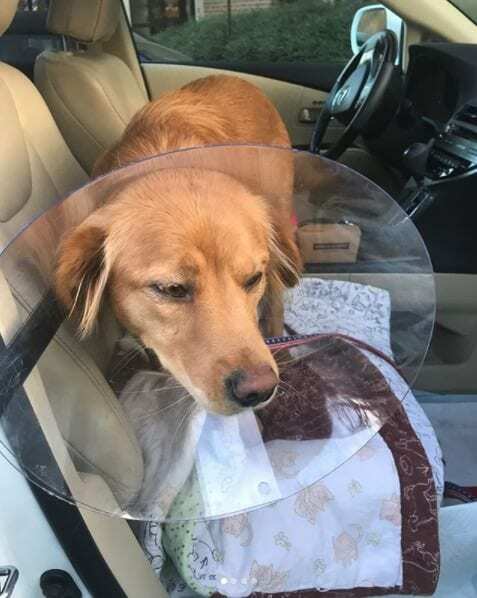 Katie took to Instagram again, posting a picture of an adorable post-op Rosie with a cone around her neck, and saying, “No more puppy rearing for this girl – time to be a pup herself.” So we guess that means we won’t get to see other cute cow puppies coming out of Rosie anytime in the future. Many people assumed that Rosie’s puppies, who are now practically celebrities, take after their father. Since they don’t look like their mother at all, that was the most obvious guess. 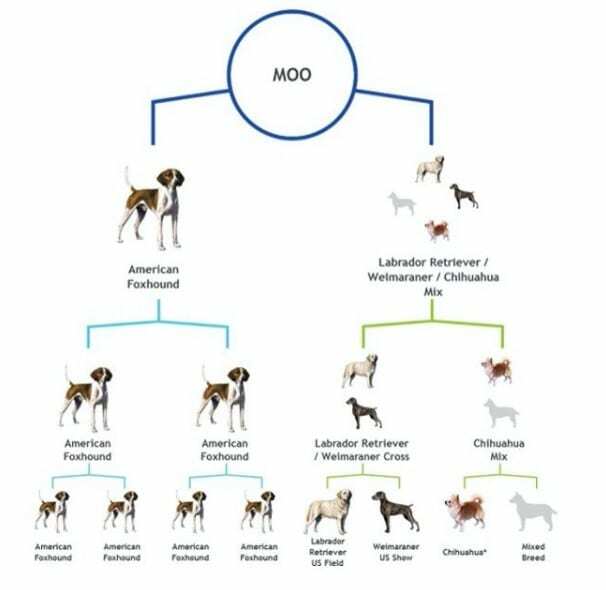 But the Blacks wanted to try and investigate to find out what kind of combination of dogs led to the birth of these puppies who looked almost like little cows. And the results that came in were more complicated than anyone probably expected it to be. The Blacks knew that Rosie was a mixed Golden Retriever when they got her. 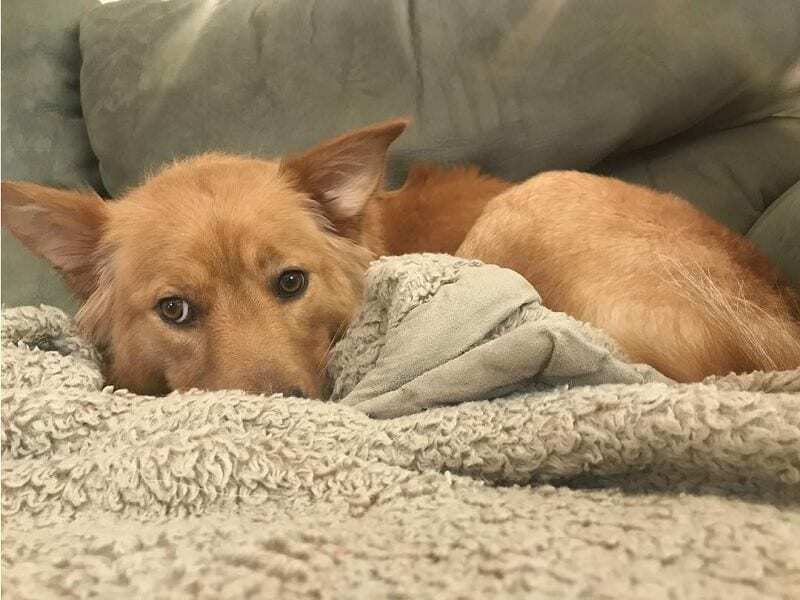 But as it turns out, Rosie is quite a unique mix. 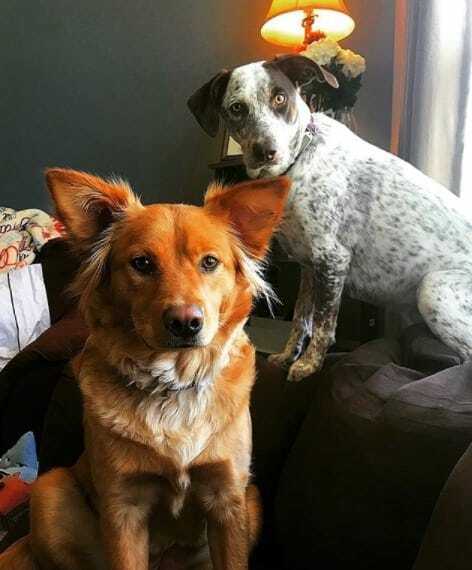 She’s a combination of a few different types of breeds – one of her parents is a Labrador Retriever mixed with a Weimaraner, and the other is a Chihuahua mixed with an unknown breed. 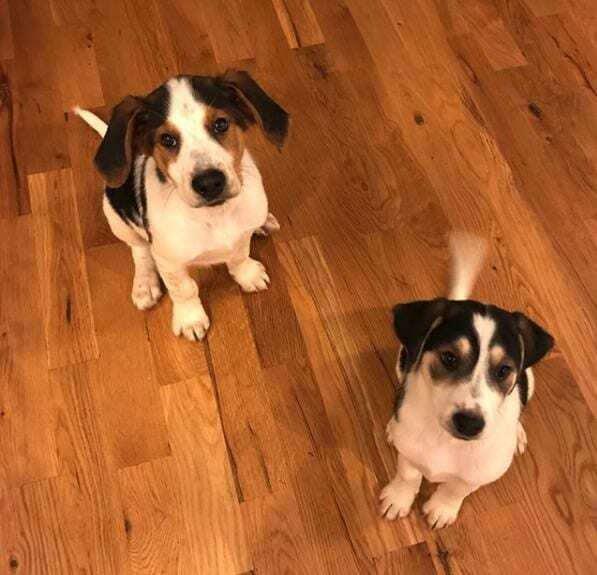 This, in combination with the American Foxhound that got Rosie pregnant, made for possibly the cutest puppies in the world. As much as the Blacks wanted to keep Rosie, they needed to give her up so they could keep fostering other dogs. They also had several other dogs under their care, and when they found a good home for Rosie – they needed to let Rosie go. 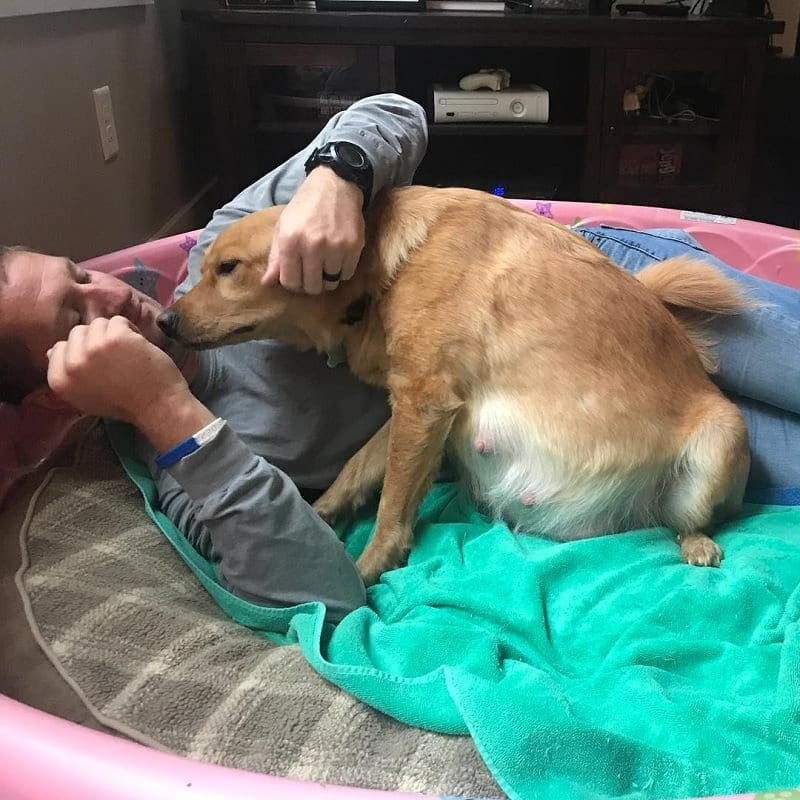 When they first brought a very pregnant Rosie to their home, Katie bathed her and cleaned her nails to make her feel better, and now she was doing the same to prepare her for meeting her new parents. Rosie looks very happy in her new home now, and has even made a good friend in Bailey, as the two love to play around with each other. It’s very difficult to find good homes for dogs nowadays, and considering Rosie’s condition when the Blacks got her, it’s lucky that she ended up in a place where she can truly be loved and taken care of. It’s a true happy ending for both Rosie, and her adorable offsprings. 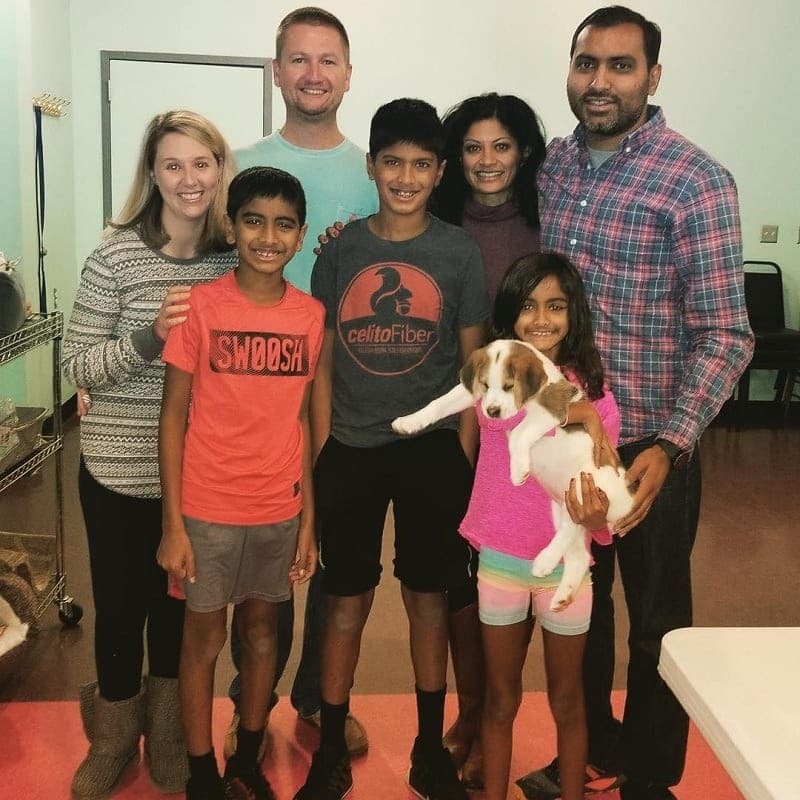 Now that Rosie is in a new, loving home, the Blacks have returned to their lives, rescuing and fostering new dogs until they’re adopted into their forever homes. 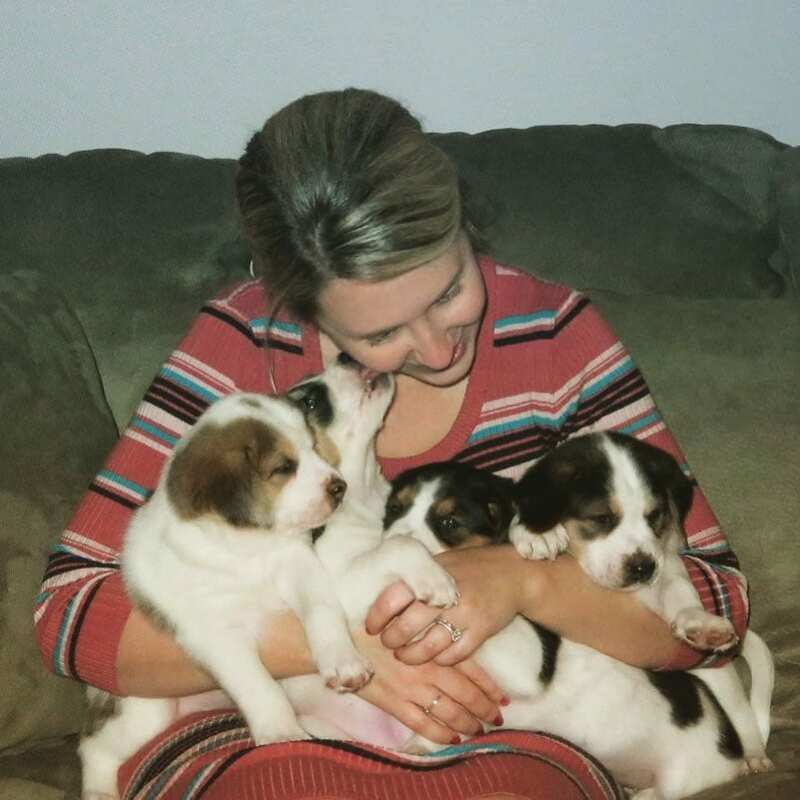 The couple recently took in three new orphaned puppies – Jolene, Jasper, and Jewel. 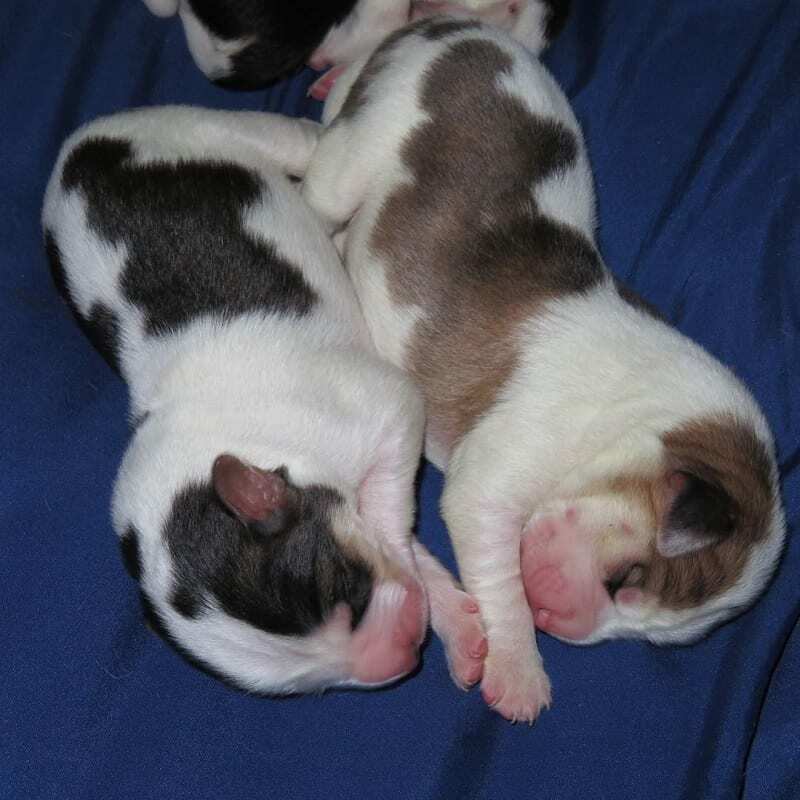 The trio of puppies, who are estimated to be six weeks of age, are extremely tiny and adorable, just like Rosie’s little cow-like pups were. And they’re already settling in with the other, bigger dogs in the house, too.